These no-bake cheesecakes are perfectly diet friendly! Make them for your next get together or the next time you're craving something sweet! 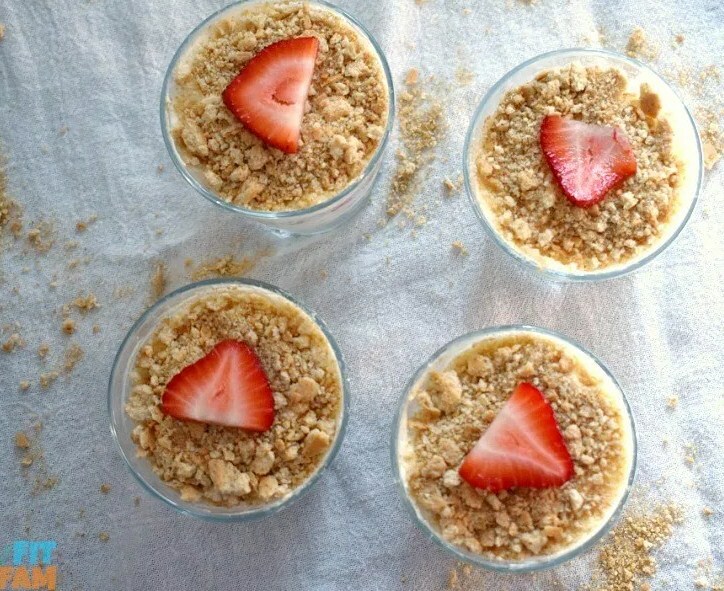 Layer each cup with 1/8 cup graham cracker crumbs, a couple spoonfuls of cheesecake mixture, strawberries, more cheesecake mixture and then top with remaining graham cracker crumbs. Refrigerate for 2 hours and enjoy. Calorie count is an approximation based on the brands we used. Also, a prior version of this recipe didn't include graham crackers. I updated the recipe and pictures to include them because we like it better this way. You can leave them out and have a lower carb count if you'd like.